Welcome to the Nonprofit Blog Carnival round-up for October! This month, we asked bloggers to offer up ideas and advice on improving the volunteer experience. 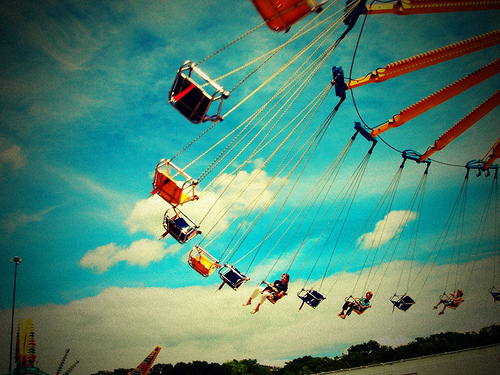 Is your volunteer's experience like a carnival ride? Do your volunteers finish their ride asking for another turn or do they beg you to stop the ride so they can get off mid-way through? Are some volunteers drawn in by the bright, flashy lights only to be relegated to the back-lot for the entire carnival? OK, so maybe I’ve taken the carnival theme a little too far and I personally don’t have the answers. But I have gathered a number of thought-provoking posts that identify some challenges as well as offering solutions to improving the volunteer experience at your non-profit or membership organization. Thanks to all of the bloggers who contributed this month. Here's the round-up which offers insight from a volunteer’s as well as an organization's perspective. What do volunteers think of your organization? While Tobi Johnson is a nonprofit consultant, her post - Deep Commitment: From the Volunteer’s Perspective - offers candid insight into her volunteer experience. In her post Tobi asks: “Why did I start? What do I get out of it? Why do I stay? … What’s my return on investment?” Then she puts on her consulting hat to offer key takeaways and practical advice for organizations that want to “connect your passions” with your volunteers’ and work toward fulfilling your mission and vision for the future. Here's another post that offers fresh insight from a volunteer’s perspective. Volunteer Speaks by guest blogger, Beverly Hom of Xico Arte Y Cultura, reminds us what it feels like to be a new volunteer. Hom asks “what makes a great volunteer experience?” and shares some insight into her personal experience. Research suggests that “a majority of Americans are civically active in their communities.” So Shari Ilsen (Engaging Volunteers) asks: “how can nonprofits like you turn civically active people into volunteers for your organizations?” in her post The Difference Between “Civically Engaged” and “Volunteer” (and How to Turn One into the Other). Shari offers some “tips based on data included in the Civic Life in America report” and the expertise at VolunteerMatch that might help you entice and engage some civically minded folks to volunteer at your organization. In addition, Shari offered up another post that explains the “7 reasons why an individual might not volunteer with your nonprofit” and ways to prevent this from happening in: Why I’m Not Going to Volunteer With Your Nonprofit. How can you engage young volunteers? “Does your use of technology make you stick out or stand out?” In her post, Trina Isakson explains How technology can make or break your volunteer engagement. Trina outlines 6 ways technology impacts the volunteer experience – from collecting information to administrative systems to social media. She suggests what technology (or lack thereof) stands out, dispels some myths and offers some solutions that will improve volunteer engagement. Thanks again to everyone who submitted posts this month. Next month, Pamela Grow is hosting the Nonprofit Blog Carnival on the timely topic: How are You Giving Thanks? If you have any tips or ideas for improving the volunteer experience that you’d like to pass along, leave us a note in the comments below. Lots to chew on here, Lori: thanks! May I just pitch in one more? There's a post from Blue Avocado I find myself returning to again and again: a firsthand account of one man's experiences as a volunteer (or, rather, as a would-be volunteer) - http://www.blueavocado.org/content/volunteer-who-couldnt - with a number of sharp lessons for volunteer coordinators. The comments section there, too, is a gold mine.